Winter Skin Protection - Amphora Aromatics Ltd – Supplier of pure essential oils and aromatherapy Products. Winter skin protection! Tips on how to moisturise and hydrate the skin during the colder months. Click to read more. The wind is howling and the cold air is all around as winter makes its presence felt. This is bad news for our skin! Find out how natural ingredients can help to keep your skin protected and in top condition. As the colder months set in, we’re face with crisp, cold mornings and wet and windy days. This, along with central heating can really play havoc with our skin. It’s important to take good care of our skin not only for it to look and feel good but to protect and keep us healthy. After all, it’s the largest organ our bodies possess and acts as a crucial barrier between our insides and the surrounding environment. So, we want to do everything we can to keep our skin in tip top condition. Skincare products can be extremely helpful but there are other things we can do to give our skin as much chance as possible to stay healthy. Keeping hydrated is vital, as is the consumption of lots of omega-3 rich foods such as avocados, oily fish, nuts and seeds. Here at Amphora we believe what you put on your body is as important as what you put in it. So, this week we’ll be giving you some ideas on how to keep your skin glowing and healthy through the winter using natural remedies and products. For many of us, our hands are the part of us which suffer the most during the colder months. Regular washing and constant exposure means they are susceptible to dry and chapped skin which can become sore and irritated if not treated in the early stages. Try to moisturise the hands after each time you wash them to help rehydrate them after being washed with soap. If possible, use a gentle soap when washing your hands to minimize stripping your hands and drying them out. 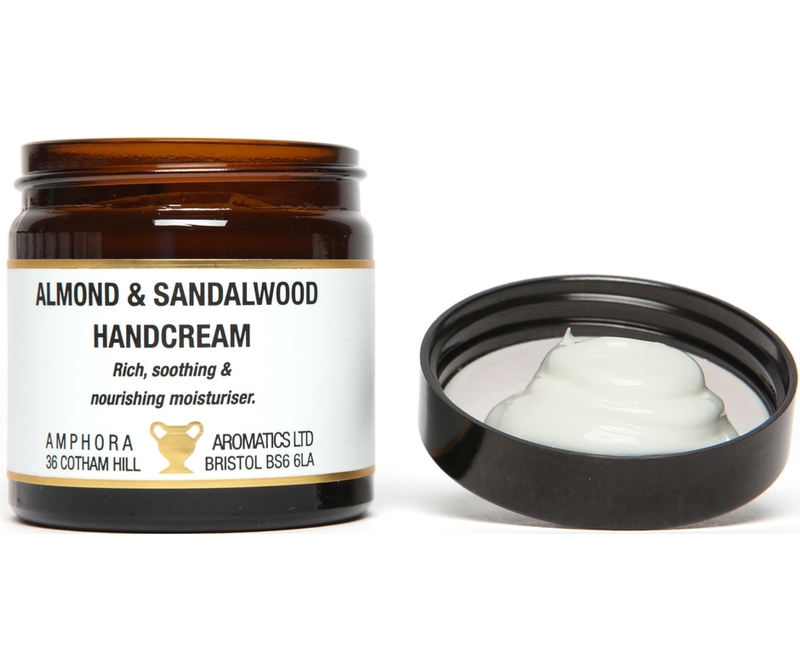 Our Almond and Sandalwood hand cream is rich and soothing designed specifically to nourish and replenish dry and overworked hands. Sandalwood is great for helping the skin to retain moisture. It’s a natural anti-inflammatory so it’s highly effective in helping soothe inflamed and sore skin. Sweet Almond oil is gentle on irritated or sore skin. Its moisturising properties help to restore and hydrate. It’s abundant in Vitamin B and fatty acids which are essential for maintaining healthy skin. We’ll have more tips, products and blends to help you keep your skin healthy and glowing during the rest of the week. So, be sure to check back over the next few days!